Our bathroom is a mess. Even if I try to clean it at least twice a week, it gets so unorganized quickly simply because it seriously lacks cabinets. The only two cabinets you can find are the tiny ones where my boyfriend and I keep our personal and skin care items such my pads, face creams, lotion, hair brush,face powder, blush on, mousse, deo, cologne and my boyfriend's deo, shaver, perfumes, etc. The cabinets are so small that we can't even squeeze in our extra toilet paper rolls. Janne, my boyfriend has long been planning of buying a Bathroom Vanity cabinet where we can have more space to arrange and store our bathroom necessities. We are looking for a cabinet in which there is enough room not just for the tiny items but more so, an area that we can allocate for the towels and robes. This is so important especially whenever a friend or a family member decides to stay with us for a night or two. That will surely be handy. 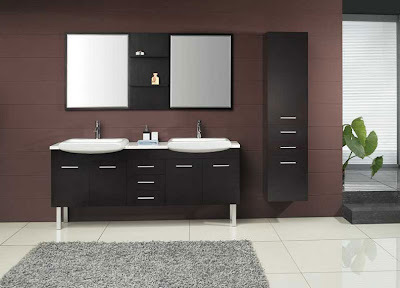 Janne then has assigned me to search through some Bathroom Vanity Cabinets which I might be interested of. Since I want to make our bathroom look more elegant and spacious, I've come up with a decision to check the selection of Double Vanities. While flipping from one photo to another both comparing prices and features, I've got my eyes pinned on the Double Vanity by James Martin (please refer on the photo to your left) which is made up of oak, two sinks made up of porcelain, faucets of chrome and full extension drawers. If ever we have extra money left, we are planning of purchasing the two mirrors with shelves - perfect match for the cabinet. I can't wait to have a more organized bathroom. Lovely!